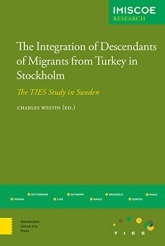 En ny bok redigerad av Charles Westin publicerades nyligen: ”The Integration of Descendants of Migrants from Turkey in Stockholm. The TIES Study in Sweden”. Boken, utgiven av Amsterdam University Press, innehåller flera kapitel skrivna av Alireza Behtoui, docent vid Socialantropologiska institutionen. "This report is the result of a study about descendants of migrants from Turkey in Sweden as part of an international research project entitled ‘Integration of the European Second Generation’ (TIES). The objective of the project is to investigate the integration process of the descendants of migrants from Turkey, the former Yugoslavia and Morocco in various fields, including education, the labour market, social relations and identity formation in eight European countries. Studies in this area, irrespective of whether they are national or international, qualitative or quantitative, often erroneously treat migrants and their descendants as a homogenous category. In this study the heterogeneity of the target category emerges both in analysis and interpretation. The heterogeneity of ‘migrants’ and their descendants is often made invisible, a trend that is even more noticeable in international comparative studies than in one-country studies (Crul & Heering 2008; Crul, Schneider & Lelie 2012)." Boken finns att ladda ner från the OAPEN Library. Läs mer om Alireza Behtouis forskning.